Narbonne offers excellent transport communication links to the rest of Europe, the A61 and A9 motorways meet here, as do two main railway lines running south from Bordeaux and east-west along the Mediterranean coast from Italy through to Spain, and in easy reach of airports at Perpignan, Carcassonne, Beziers, Montpellier and Gerona. Once a prosperous port, it is now located about 15 km from the shores of the Mediterranean Sea. It has a larger population than Carcassonne, although the latter is Aude's capital or préfecture. 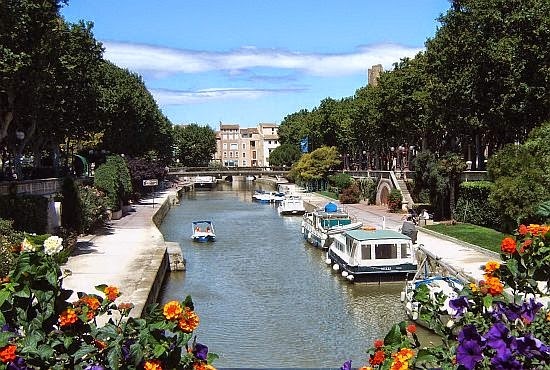 Narbonne is linked to the nearby Canal du Midi and the Aude River by the Canal de la Robine, which runs through the centre of town. You can take a canal trip to Port la Nouvelle or le Somail, or hire a motor boat. Narbonne was founded on the Colline de Montlaurès which has been inhabited since the 7th Century BC. By the 2nd Century BC the Roman city of Narbo had become one of the most important in southern Gaul. The Visigoths made it their capital when they invaded in the 6th Century AD. The decline began in the late 14th Century when the port silted up followed by the Hundred Years War and the Black Death. In the mid-19th Century, the building of the railway and the expansion of the vineyards restored its vitality. 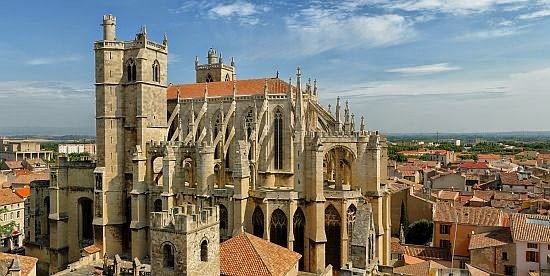 The climate and weather in Narbonne due to its situation in the Mediterranean, offers one of the best and sunniest climates of the whole of France - there are more than 300 days of sunshine per year! Narbonne and its region are attractive all year round. Located in the heart of the Fontfroide mountainous area, Château de Jonquières guest house offers an outdoor swimming pool, sauna and tennis court. Wine tasting is available at the Narbonne wine shop. Surrounded by a large park with vineyards nearby, Château de Jonquières is 8 km from the centre of Narbonneand 23 km from the beach in Gruissan. Guests can visit Cathar sites in the area and Carcassonne is a 45-minute drive away. Perpignan Airport is 64 km away. Comfortable restaurant - ROUTE DE SALLES D AUDE F - 11110 Coursan This restaurant is housed in a small mansion on the edge of the village near the Aude river. Well-lit dining areas decorated in pastel tones, serving traditional cuisine, fine choice of wines. Cruise on the canal de la Robine - You can take a canal trip to Port la Nouvelle or le Somail, or hire a motor boat. A part of the UNESCO World Heritage, the "Canal de la Robine" ensures the connection between the "Canal du Midi" and the Mediterranean Sea in Port La Nouvelle. It occupies the old bed of the Aude River diverted by a violent flood in the end of the 14th century. It is today a major axe of river tourism; its banks have been laid out with a pedestrian installation prolonged by cycle tracks. In the City, its banks are bordered of an important real estate heritage of the 19th century and wine storehouses, testifying of the wine golden age. Hike and stroll on the nature trails - On different paths around Narbonne take your time to discover the diversity of Languedoc territory. With a guide or on your own, you will appreciate the beauty of the environment of the landscapes. Take a walk between trails, scrubland and ponds, and discover a wonderful Nature. A 15-km (9 mi) road across the Massif de la Clape links urban Narbonne to its beach and resort.